PressPerCent project started around 20 years ago as a simple ink key pre-setting software tool  a popular subject at the time when printing press manufacturers and printers were searching for less expensive, space-saving solutions to replace hardware plate scanners. 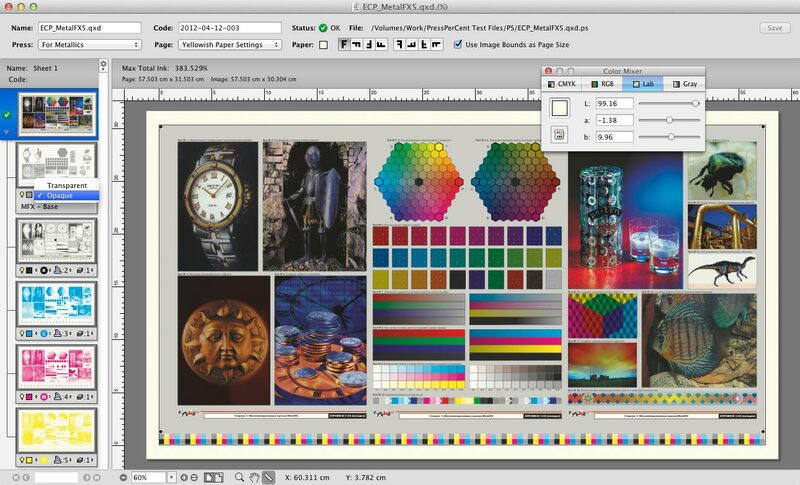 Since then PressPerCent evolved to include more features that customers required such as support for the job format of dozens press types and models, total ink area calculations, spot color preview, automatic job processing and flexible press configurations. Made for the graphic arts industry standard Apple Macintosh computers, PressPerCent is fast to adapt to changes in new Mac operating system versions. At the same time it tries to support older Macintosh hardware and OS versions as long as possible. The current version of the application works with OS X 10.9 (Mavericks), OS X 10.10 (Yosemite), OS X 10.11 (El Capitan), macOS 10.12 (Sierra), macOS 10.13 (High Sierra) and macOS 10.14 (Mojave) system versions. 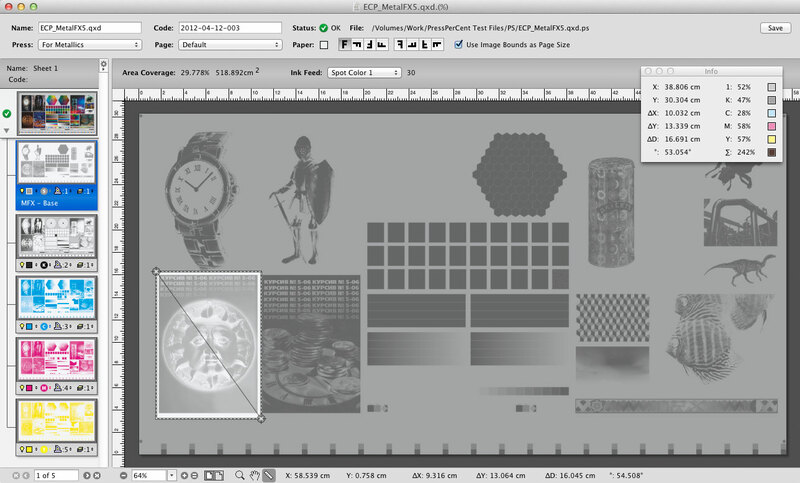 PressPerCent calculates area covered by the image on the plate for each ink zone of the printing press. The result is adjusted with user defined calibration curves for specific press models or ink/paper combinations and could be used as ink zone (ink duct) settings for the press. These settings could be displayed on screen, printed out on paper or exported to variety of file formats. Press operators can use the settings to preset ink keys on the press console when the job changes. This can improve make-ready times and reduce paper and ink waste. The accuracy of pre-settings depends on press conditions and the zone curve's calibration quality. PressPerCent calculates not only individual zone coverage, but also the coverage for the entire area of the plate. Knowing this value helps estimate the amount of ink required to print the job. 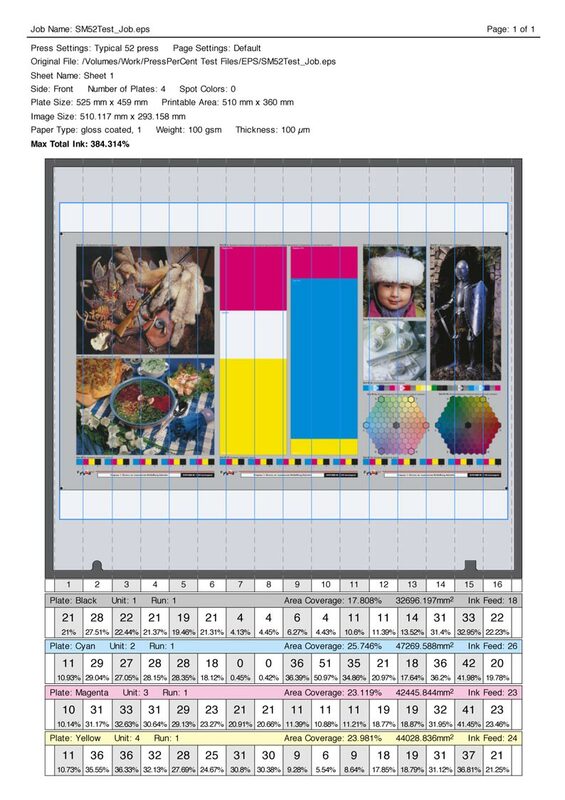 This feature would also be beneficial to packaging printers with flexographic equipment (to calculate amount of Pantone inks for the job) or even to digital printers (to quote the price based on a toner consumption). If you only need to know the area coverage for a job without ink zone information just toggle the check boxes in PressPerCent preferences to switch off the zone calculation and display. Even if it is too late to re-separate photos or change vector graphics of the job when the plates are ready, the printer should pay attention to the maximum Total Ink warnings and take steps to avoid the problems: reducing the speed of the printing press, choosing different paper stocks or asking for another set of plates. 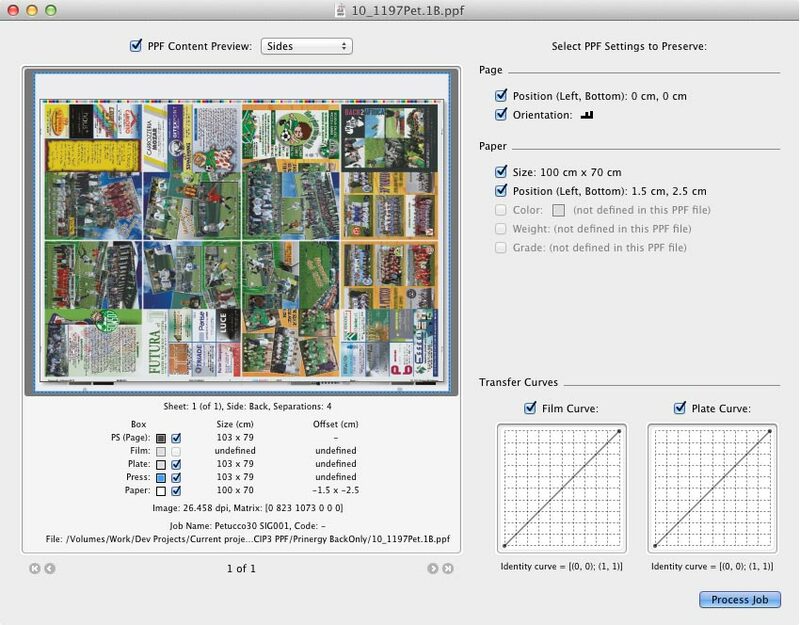 PressPerCent calculates maximum total ink value for each sheet of the job and shows the problematic areas based on user defined size settings (to ignore control bars and registration marks that may exceed maximum total ink without negative effects). Almost every printing press made since the early 90's can either save printed job settings to a file (on network or removable media i.e. floppy disks) or load image area information from files prepared by plate scanners. Proprietary job file formats can be quite different for each press manufacturer, press model or even press console version. Some presses use plain text files that are easily readable and understood by people. Others use binary data that requires more efforts to interpret it. Few press consoles may even show the press operator a preview images of the job prepared by the pre-setting software. This helps to identify and load jobs more quickly. Despite these differences, all press file formats convey the same common information: ink keys and ink feed (ink sweep) settings for each unit of the press or ink zone area calculations performed by a plate scanner. PressPerCent uses this similarity of press file formats and supports different press models via the export plug-ins mechanism. The export plug-ins are small modules that save common information prepared by PressPerCent in a specific file format understood by this or that press console. This approach extends support for various presses without constantly modifying the application for each press or overloading it with code and features other users will not need. Just add to the application the plug-in for your press from optional plug-ins set. If you cannot find your press in the plug-ins set or you need a different plug-in version, please contact us and we will try to create a new plug-in for you. PressPerCent supports the following file formats for incoming jobs: PostScript, PDF, TIFF and PPF. If a job arrives as a PostScript file it will be converted to PDF with a built-in Mac OS X normalizer (or with Adobe Acrobat Distiller if Adobe Acrobat package is installed). TIFF files could be either 1-bit or 8-bit (low resolution previews) made by the RIP. For PostScript and PDF jobs with spot colors we suggest that you use pre-separated files to avoid possible problems with color separation. However, the best choice of incoming job file format for PressPerCent is CIP3/CIP4 PPF (Print Production Format). The new JDF/JMF formats for "seamless integration of CRM, MIS, prepress, press and postpress" being developed by CIP4 consortium looks promising for the future of the industry. The older PPF format well defined back in 90's already delivers certain benefits today. Unlike JDF, the PPF format does not require sophisticated workflow software to be produced or interpreted. The PPF format is more simple and hardware independent than JDF. The PPF file created by the prepress system does not contain actual ink key settings or press unit specific information (as JDF may have). It has only a low resolution image of the plate that will be processed into ink keys by some pre-setting tool or advanced press console. Due to the simplicity and fewer steps required to implement, the support for the PPF format was included into the products by almost every prepress RIP vendor and many printing press manufacturers. PressPerCent can work with the PPF format in every way. It can import a PPF file made by your RIP or workflow, display the job on screen and calculate ink key settings for your press. It can also export a PPF file from a PDF or TIFF file of the job. You can send this PPF file to a different software tool that calculates ink key settings for your press or directly to the press console, if it supports that format. It is always a demanding task to predict the exact results of printing with spot colors, especially with tricky inks like varnish or metallics where the order of printing units may have severe effects on the final output. Printing on colored, tinted or metallic paper presents a similar problem. In PressPerCent a user can define the order of inks and their units assignment, specify if the ink is transparent or opaque and choose the paper color. If the job is printed in several runs (on a two color press, for example) the output of each run could be previewed or printed. Every production site has its own workflow that is based either on a sophisticated prepress software system or just on a single, stand-alone RIP that completes the job from processing incoming PDF or PostScript impositions to controlling plate production on a CtP device. Whichever you use, if the workflow supports the automatic export of TIFF or PPF files to a folder on the network file server PressPerCent could be integrated onto it. PressPerCent can periodically scan the user defined "Hot Folder", process incoming files and export the ink presets into another folder for the next step of your workflow. Any number of hot folders with different press and job options can be set up. You can find more information about PressPerCent in application's User Guide in PDF-format. This PDF file is also included on DMG image with the application. System requirements: Apple Macintosh with OS X 10.9 (Mavericks), OS X 10.10 (Yosemite), OS X 10.11 (El Capitan), macOS 10.12 (Sierra), macOS 10.13 (High Sierra) or macOS 10.14 (Mojave). Internet connection is required for software activation. This is full working version of PressPerCent application. However, until you purchase the license and enter correct serial number (that will be sent to you via e-mail after purchase), PressPerCent works in Demo mode. The difference from registered version is that you can not modify printing press sheet dimensions to match your press. Demo mode makes it a bit difficult to use PressPerCent for real production purposes, but it allows to test the application in existing workflow environment. Processing improvements for 8-bit TIFF files. Fixes and enhancements accumulated since 3.4.16 release. Minor fixes to application and plug-ins code. Minor fixes and enhancements for application and several plug-ins code. Minor fixes and enhancements accumulated since 3.4.12 version release. SmartCard Writer application (that could be used to write cards for Manroland presses) was updated to version 2.4. Minor fixes and enhancements accumulated since 3.4.10 version release. SmartCard Writer application was updated to version 2.3.1 (with support for new revision of HID OMNIKEY readers). Minor fixes and enhancements accumulated since 3.4.9 version release. SmartCard Writer application (that writes Job Cards for Manroland presses) was upgraded to version 2.3 with support for ACS ACR38U readers. Minor fixes and enhancements accumulated since 3.4.8 version release. Fix for Application Support folder creation problem (that appeared in 3.4.7 version). Minor fixes and changes to the application and several plug-ins. Several reported issues were fixed. Minor changes in settings and options configuration. Several issues were resolved and fixed. Updated plug-in versions are provided in Optional Plug-ins folder. Minor fixes to main application and selected plug-ins. Print and PDF Export commands were replaced by configurable list of commands with more options. New option to automatically combine 1-bit TIFF (and CIP3 PPF) separations in hot folders was added to Processing Schemes. SmartCard Writer application (that writes Job Cards for Manroland presses) was upgraded to version 2.0 with support for OmniKey CardMan readers and UI changes. More flexible job processing with customizable Processing Schemes. Tone Curves for halftone/dot-percentage compensation in Page Settings. Automatic mounting of network servers. Minor fixes and changes as requested by users. Minor fixes and changes in some plug-ins. Minor features upgrade as per users requests, interface fixes and performance improvements. Fixes issue with preview creation in BMP format (used by several plug-ins). Restores ability to read/open resource-based jobs and settings created by old PressPerCent versions. Some fixes for obscure bugs in application and plug-ins code. New preferences options to define Name Presets for export files. All export plug-ins were updated to work with Name Presets (older plug-ins are not compatible). Some interface fixes and improvements. Units List (in General panel of Press Settings dialog) was replaced by more compact graphical view with press configuration scheme. Units and Runs there can be rearranged by drag'n'drop now. Individual Unit Rules (in General panel of Press Settings) and Hot Folder Actions (in Production panel of PressPerCent Preferences) can now be rearranged using drag'n'drop. Hot Folder Actions are now more compact (that makes possible to configure many actions for each hot folder on smaller screens). 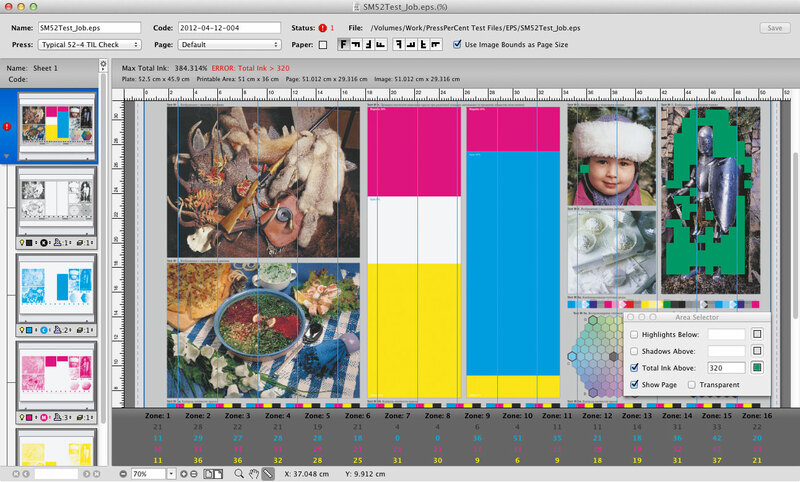 Processing of CIP3 PPF files with composite CMYK previews was fixed. New preferences options to manage Spot Color Libraries. New options to define Non-printable (proofing) spot color names. More options to control disk space used by PressPetCent's jobs. Internal changes to make settings and preferences data saves more reliable (to prevent accidental data loss). Changes to several plug-ins code. Stability and interface fixes (a problem with application crash after user types new name for spot color or changes sheet name was fixed among other stuff). Fixes for several plug-ins code ("Heidelberg CDK", "Mitsubishi REP"). Improved processing of subfolders with jobs within hot folders. 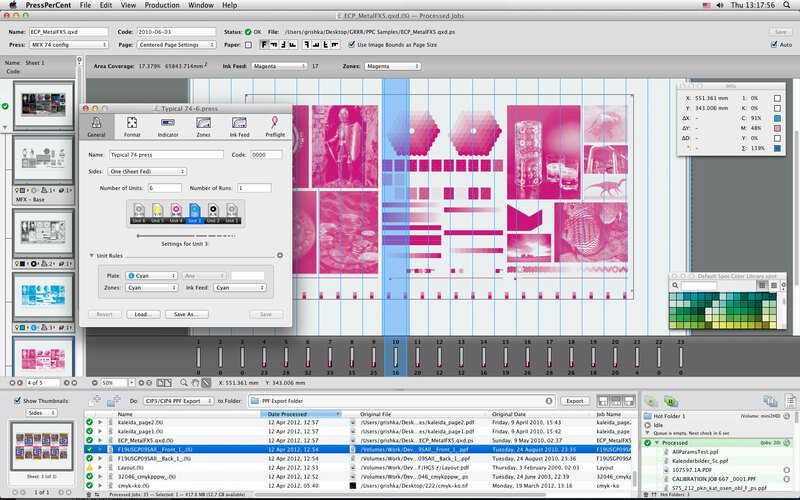 Visual changes to layouts of printouts. New Flood Coating option with fixed values of ink keys for press units. Additional application version with Mac OS X 10.4 compatibility is included. Another bunch of fixes for 3.0.x versions. This version fine-tunes parts of Cocoa interface code. Recommended update for all PressPerCent users. Adds 64-bit code version for both Intel and PowerPC based Macs. Major internal and minor user interface changes that were required for 64-bit support. Stability fixes for multi-cores and multi-processors systems. Stability fixes for Hot Folders processing in Demo mode. Internal changes to UI support code. 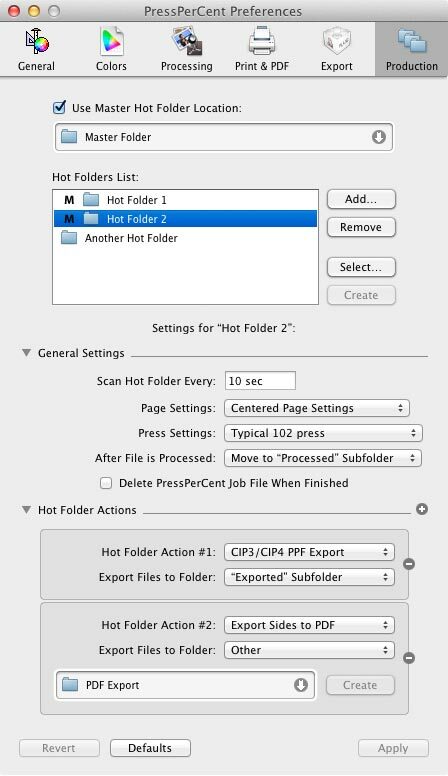 New Hot Folders Monitor window for better control of hot folders processing. New Inspect PPF File command that shows preview for jobs in CIP3 PPF format and lets you to tweak some options before processing them. 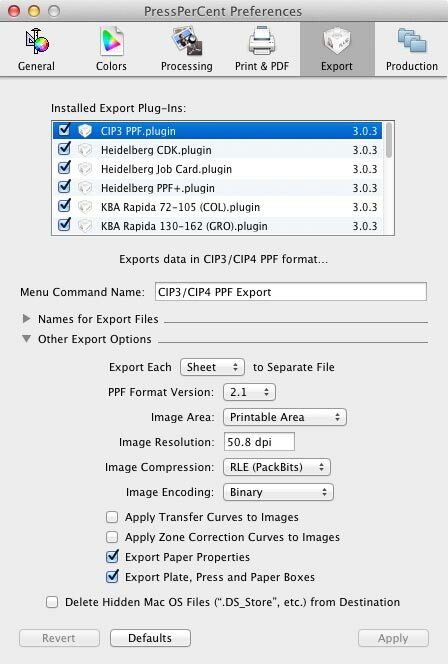 Improved CIP3 PPF files handling that allows to preserve page and paper properties of incoming files. New Activity Log with improved display of jobs processing status. New single window interface option with all frequently needed stuff displayed in one window. New thumbnail preview for the selected job in Processed Jobs list. Hot folders now could be configured to perform more than one action on incoming files. New export plug-ins (old plug-ins are not compatible). Jobs processing and other internal parts of the application were re-written to take better advantage of multi-core and multi-processor systems. Improved PDF and TIFF files processing. New internal jobs format for faster jobs opening/loading. More polished interface look and better screen preview. New printing and PDF export with more options. New paper specification options in Page Settings. More options for press indicator. New dialog for multiple jobs export. By entering serial number in Activation dialog displayed at application start up you will turn Demo into full licensed activated copy. Please, do not forget to deactivate PressPerCent before moving the license to another Mac computer. Use Deactivate command from Help menu to perform deactivation. 1. Those users who purchased PressPerCent license less than 5 years ago get all version updates and upgrades for free (without any additional fee). If you purchased PressPerCent less than 5 years ago and the serial number you have does not work with the latest application version (due to serial numbers scheme changes or for other reasons), please send us e-mail to info@excourse.com. 2. Those users who purchased PressPerCent license more than 5 years ago and would like to update their existing serial number to the latest application version may renew their license for additional fee of $100. To renew PressPerCent license: click this link and purchase PressPerCent License Renewal from our online store at FastSpring . 3. License renewal is good for another 5 years term of free updates and upgrades. Note: This is not any kind of subscription and it does not mean that your existing PressPerCent license becomes invalid after 5 years of usage. You can use it as long as you like for as many years as needed. It just limits the ability to receive free upgrades to current modern versions to 5 years since purchase (or previous renewal) date. We would like to hear feedback on the benefits and shortcomings of our software. Please include your suggestions and comments with information on what hardware and operating system you are using with PressPerCent. Note: We do answer ALL e-mails with questions about Excourse software. If you did not get a reply within 2-3 business days, there is high chance that our reply (or your e-mail) fell a victim to some e-mail filters. Please, repeat your e-mail (if possible, use a different mail server with not so smart anti-spam system).